Federal Tax Revenues Crashing - How Will the Government Cope? Are Middle-Class Tax Increases on the Way? We've written a number of articles on this site detailing the problems that many states have had when it comes to balancing their budgets. 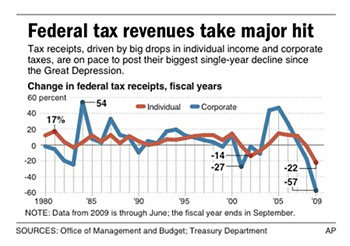 Most states are dealing with a drastic drop in tax revenues - income tax, corporate tax, you name it and it's falling. Now, many people naturally assumed that the federal government would be dealing with the same problem. With millions of Americans losing their jobs and corporate earnings on the decline, it was a pretty safe assumption that federal tax revenues would be way down as well. However, an article from Stephen Ohlemacher of the Associated Press yesterday hit the general public like a brick to the face. Federal tax receipts are on pace to drop 18 percent this year, according to the article. This would represent the largest single-year decline since the Great Depression. individual income tax receipts are down (22%). 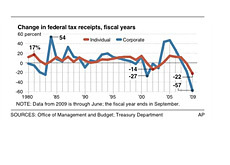 Corporate income tax receipts are way down (57%). Social security tax receipts are lower. Medicare taxes are lower. How do you compensate for this dramatic drop in tax revenues? Three ways - by cutting spending, by raising taxes or by borrowing. There is no way that spending is going to be cut anytime soon. Domestic agencies' spending is expected to increase by 11% in 2010, and military spending is expected to increase by 4%. On top of that, you also have a very expensive expansion to the health care system that is looming on the horizon. In short - spending isn't going to drop any time soon. Not a chance. Borrowing? The US government already has a national debt that is in excess of $11 trillion dollars. This number is expected to skyrocket over the coming years, and let's not even get into the government's unfunded liabilities. Alarms are increasingly being sounded in Washington over the country's exploding debt totals, so you can probably expect that there will be significant pressure placed on those in charge to start doing something about the massive deficits that we are currently facing. This leaves us with one option - raising taxes. On Sunday, Treasury Secretary Timothy Geithner and Larry Summers, director of the National Economic Council, made headlines (and plenty of Americans nervous), when they said that they could "no longer guarantee that the middle class will be spared a tax increase". The Obama Administration quickly shot down this statement on Monday, claiming that they had no plans to raise taxes on middle-class families. Many people are taking these comments with a grain of salt, as they are reminded of George H.W. Bush's famous "read my lips" speech in the late '80s. Bush promised that he wouldn't be introducing any new taxes, only to have to renege on his promise due to a crippling recession. Many are wondering if the Obama government will have to go back on a campaign promise as well in an effort to increase tax revenues. If everything goes according to plan, the largest economy in the world will regain its footing and continue the robust growth that most people are accustomed to. But what happens if this recovery doesn't take place? 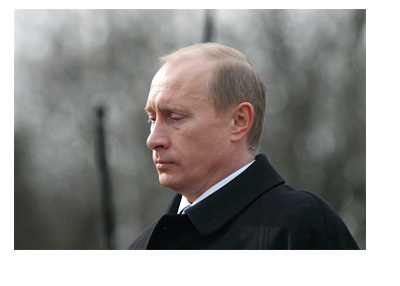 Or what happens if the recovery is much weaker than what most people anticipate? What happens if unemployment numbers stay high and individual income tax receipts stay low? What happens if corporate earnings doesn't start to substantially improve? What then? Stranger things have happened - how would the federal government cope with a "double-dip" recession? What's your gut feeling? Are wide-scale federal tax increases on the way?